I like the tan 2 tone interior in my black '00. If they don't break coming out or are not already damaged might be interested in a couple pieces if you decide to sell them. The pillars over the front door down to the dashboard if you can manage to get them off without breaking any of the clips behind them. Just so you know. Pretty sure it can't be done. The parts running along the bottom of the front doors. Assuming the ends are not all cracked and the collars the screws go in are solid. Almost always not. The sills at the bottoms and tops of the cargo areas. Again there are clips behind the top one that like to break off like with the pillars. Also the bottom sill is usually trashed too. Would have to be in near perfect shape though. I have already sourced most of these in better shape. Same with the upper cargo sill. The lower sills along the front door I grabbed a couple in decent shape but need to glue back on a couple collars that the screws go in underneath. But the fronts are not cracked like they get. And the lower cargo sill I just bought a new one of but since that takes a real beating would not mind having a spare. Chili Pepper Red FTW! I also have a '99 and a '98. Both Chili Pepper Red. I also took the door trim off the '98, looks so much better. I put this lift on the '98 (https://dpgoffroad.com/product/2-5-u...mu-hybrid-kit/). Really nice quality. I just wanted to get everything right the first time. I am in Aldie, VA. Maybe I'll see your Chili Pepper red XJ sometime. My wife drives the '99 all the time in Gainseville. It still needs the front fenders painted after the accidents and rebuilds (https://www.cherokeeforum.com/f2/reb...-apron-226647/). 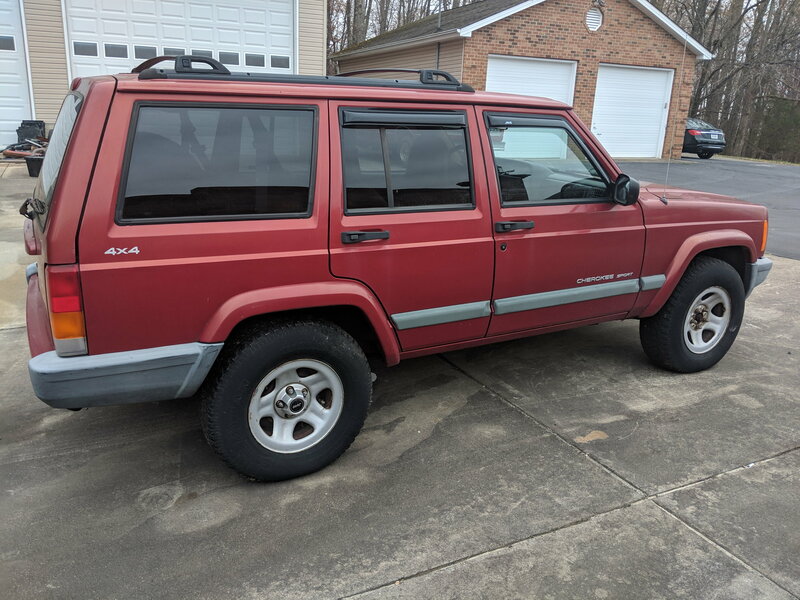 If you see a Chili Pepper red XJ with grey front fenders in Northern VA, you'll know who's it is.